With the experience accumulated by ELIMO®, costs can be optimized as early as in the project planning stage. As a result of a wide customer base in a great number of different projects, ELIMO® is always facing new challenges. The reason for their success is continuous innovation and the confidence of customers. 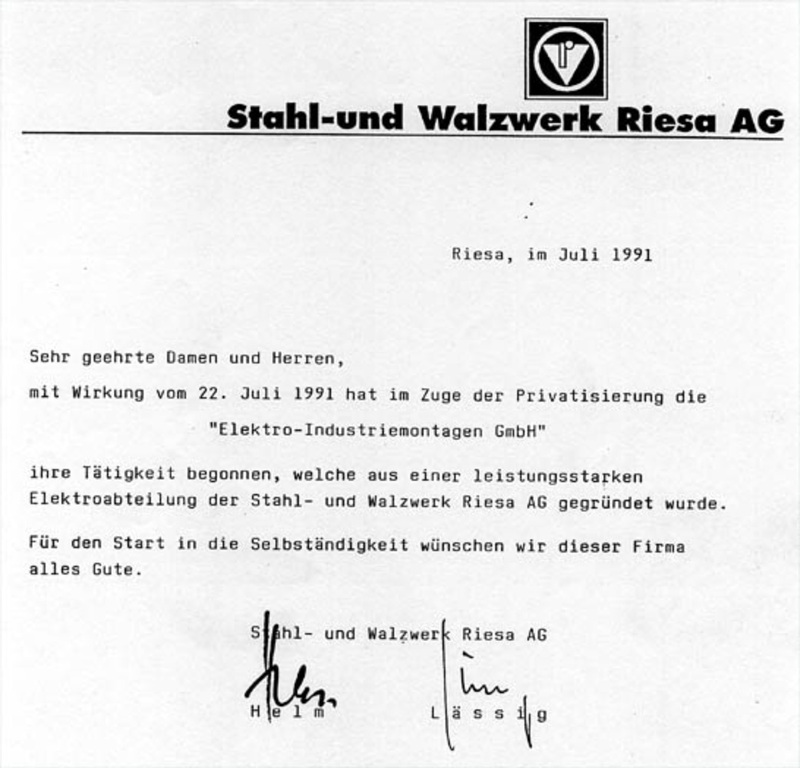 The company ELIMO® arose as an independent company on 22nd July 1991 from the electrical department of Stahl- und Walzwerke Riesa AG. The step to the independence was made with 15 of the 250 qualified employees. 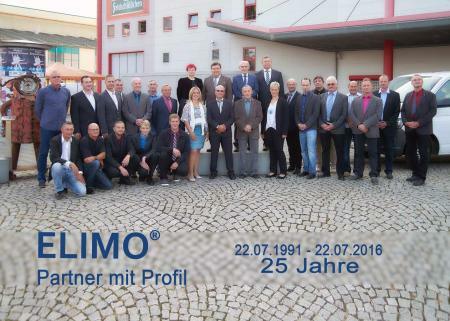 Today ELIMO® consists of a team of 36 experienced employees. They are made up of 27 electricians, two trainees and five engineers. In order to meet the high level of quality-control demands in the future, ELIMO® carries out targeted instruction and advanced training of specialist personnel within the company. With a reliable core employee staff from the region, and supra-regional advanced training measures (product and technology training), ELIMO® is ready to face the challenges of tomorrow. The instruction and advanced training of our specialist personnel is implemented within the ELIMO® company with the utilization of regional resources (BSZ technology, qualification center, AMVZ) and supra-regional offers (product and technology training sessions for cable installations, introduction of new products and/or new technologies). In this way, a high quality of service is achieved and the support provided to our customers continuously improved. Our internal specialist training of apprentices and BA students has high priority in the company development. This provides for continuous growth at ELIMO®, and ensures a healthy company structure for the future. In order to enable optimum structuring of assembly times on site, pre-assembly work is implemented in the ELIMO® workshop halls. Quality and safety have high priority at every stage of the planning and assembly process. 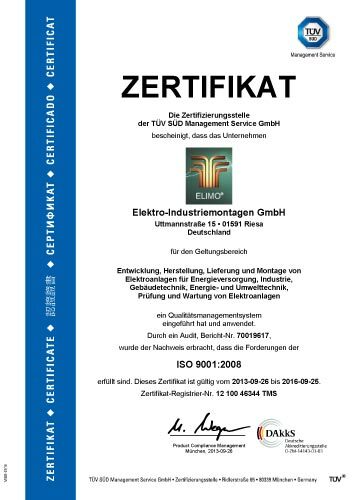 In summer 1998, ELIMO® set itself the challenge of acquiring for the first time the TUEV CERT certification according to DIN EN ISO 9001. A quality management system was introduced, which finds application in all work sequences. In September 2013, the fourth audit was implemented, where meanwhile ELIMO® was certified according to DIN EN ISO 9001:2008. 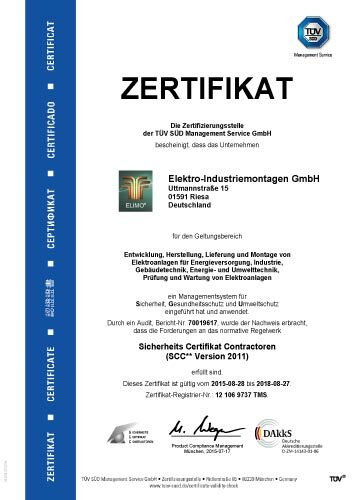 By mid-2015, the certification of ELIMO® was implemented according to DIN EN ISO 9001:2008 (quality), DIN EN ISO 14001:2009 (environmental protection) and SCC 2006 (occupational health and safety). This “Integrated Management System” increases the effectiveness of the existing management system and creates confidence in principals and customers. Safety, health and environmental protection are sustainably improved within the ELIMO® company. 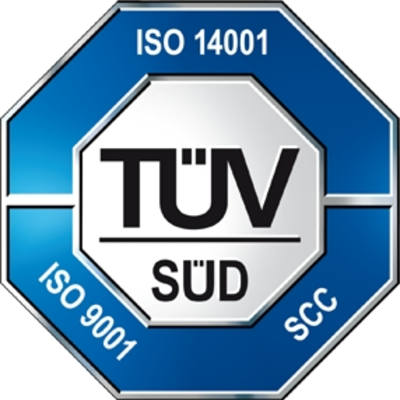 Have a look at our Documents of Certification. Auf der Webseite von ELIMO Riesa verabreiten wir keine personenbezogenen Daten, im Cookie wird die von Ihnen ausgewählte Sprache der Webseite gespeichert. Dies ist gedacht, um bei erneutem Aufruf der Webseite die vorher gewählte Sprache zu erhalten. Auf dieser Website können keine Kommentare hinterlassen werden. Diese Website nutzt aufgrund unserer berechtigten Interessen zur Optimierung und Analyse unseres Online-Angebots im Sinne des Art. 6 Abs. 1 lit. f. DSGVO den Dienst „Google Analytics“, welcher von der Google Inc. (1600 Amphitheatre Parkway Mountain View, CA 94043, USA) angeboten wird. Der Dienst (Google Analytics) verwendet „Cookies“ – Textdateien, welche auf Ihrem Endgerät gespeichert werden. Die durch die Cookies gesammelten Informationen werden im Regelfall an einen Google-Server in den USA gesandt und dort gespeichert. Google LLC hält das europäische Datenschutzrecht ein. Testing and maintenance of elec. systems. Our references clearly reflect our profile and our understanding of quality. Every new project demands specific solutions. We are glad to face new challenges and to provide our know-how for the realization of optimum solutions. Innovation is the drive-motor behind our work. Do you have a requirement which we have not yet handled? Then contact us and we will prepare a solution! „Time is money“ applies for this sector to a special degree. The high outlays of energy and material require stable and secure time management of electrical systems in case of maintenance and new installation. ELIMO® is at home in this environment. 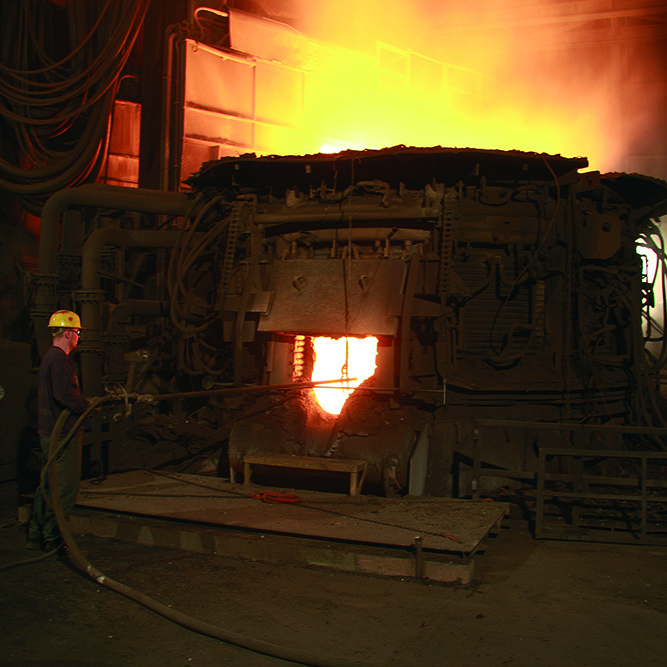 With its steel mills, the Riesa location has been the starting point for the development of modern and cost-efficient solutions which ELIMO® passes on to its customers. Similarly successful business sectors of ELIMO® are electrical installation and maintenance services for electrical energy suppliers. A wide area of electrical services is covered in this case. The main emphasis is on the overhaul, renewal and testing of medium-voltage systems, where close cooperation is implemented with all well-known system suppliers. However, cable installation services (including malfunction service) are also included in the program. A further emphasis of ELIMO® is the installation of substations with a mains voltage of 110 kV to 380 kV. The future of energy generation will be determined by increasingly more efficient, environmentally-protective technologies. ELIMO® is already participating throughout Europe in the realization of this new regenerative energy generation, with wind, solar energy and biogas. As a result of close cooperation with various power providers, power feed into the networks of power providers has increasingly become a core competence of ELIMO® over the years. In order to achieve solutions suitable for the applications, close cooperation is implemented with the customer in the planning, installation and support of substations. What does a show or a concert have to do with electrical installations? According to location, air-conditioning equipment can place considerable power demands. Intensive lighting systems and platforms which are moved also require energy. A power management that considers damage situations as well requires knowledge and awareness of responsibility in the planning and installation. Regardless of whether it involves regional projects like Sachsenarena in Riesa or international orders such as the opera house in Oslo, the services of ELIMO® provide security for our customers. Where a lot of energy is required, the demands increase in the planning and realization of electrical installations. 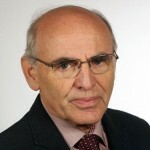 Security and long-term stability play a considerable role in such processes. KOMATSU is one of the leading manufacturers of machines for the mining industry. ELIMO® offers the planning and installation of electrical switchgear and control systems for large capacity excavators, as a finished module. The assembly and first intermediate testing of these modules take place in the ELIMO® halls, which provide reliable performance on sites all over the world, such as North and South America, as well as Asia and Africa. 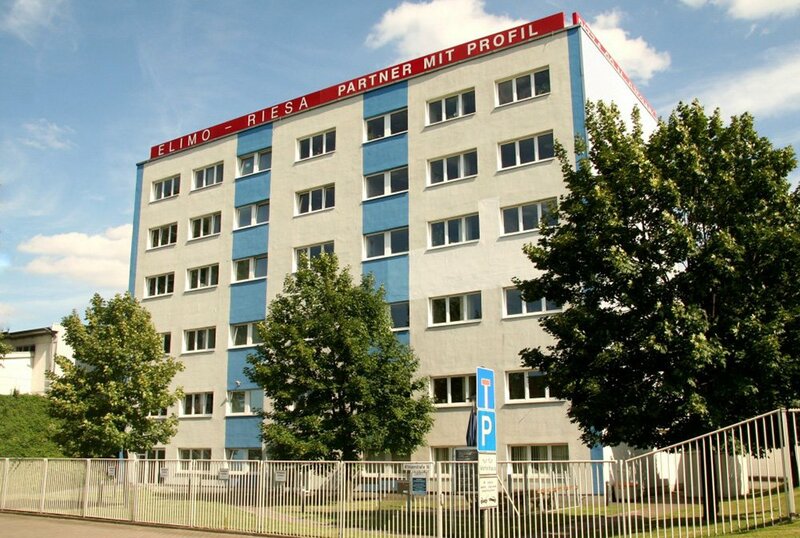 This Internet site is operated by the company ELIMO® Elektro-Industriemontagen GmbH, Riesa (see address for contact) and will be extended by additional information if required. The objective of the Internet page is to provide for our customers with an appealing initial summary of the company, and of our extensive service offer. Liability exclusion: All links offered on this Internet page serve for the purpose of providing additional information. Both the content-related, as well as the formal structuring of the WWW pages reached by means of link are exclusively in the sphere of responsibility of the respective owner/operator. At the time of recording of a link we ensure that no illegal, pornographic or other contents, which in our opinion are unsuitable, are included on these pages. Should you have any objections or commentary concerning one of the said links, we request you to make a corresponding notification. Caution: With the judgment, dated 12th May 1998, the Hamburg Regional Court decided that the setting of a link relates the contents of the linked page to the party setting the link and, where appropriate, makes this party responsible for them. This can be prevented only when the party explicitly distances themselves from the contents of the linked pages. The integration of this web page into an external framework architecture (frames) is permissible only following our prior written approval. On the other hand, normal links to this web site outside of a framework structure are allowed without request and are explicitly desired. On request, we would be glad to send our logo to you in the format desired by you. The structuring of this Internet presence has been implemented through WFP audio-video productions.